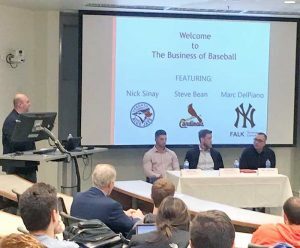 On November 7, 2018, the Department of Sport Management hosted a panel discussion titled “The Business of Baseball” in Falk College at Syracuse University. Students heard from former Minor League Baseball players Steve Bean and Nick Sinay as well as Marc DelPiano, a current scout for the New York Yankees who also played two seasons of minor league baseball. The panelists discussed opportunities in professional baseball operations, scouting, front office administration, and analytics. They also provided insight on how players progress through the minor league system, from signing a contract to agent relations, nutrition, and endorsement opportunities. Sport Management assistant teaching professor Dave Meluni organized the event and moderated the discussion. “It was a tremendous opportunity for our students to hear from these professionals who are knowledgeable in all aspects of the game, from a player perspective and from the business side,” said Meluni, who teaches sales, sponsorship and promotion, and managing the sport organization at Syracuse University. Bean was drafted by the St. Louis Cardinals in the first round of the 2012 MLB June Amateur Draft out of Rockwall High School in Rockwall, Texas. He played more than 300 games for five teams in the minor leagues. DelPiano is a scout for the New York Yankees. He previously served as a Special Assistant to the General Manager for the Pittsburgh Pirates from 2008-2015. He then became the Vice President of Player Development for the Miami Marlins through September 2017. Sinay, a Marcellus (NY) High School graduate, was drafted by the Toronto Blue Jays in the 22nd round of the 2015 MLB June Amateur Draft out of the University of Buffalo. He played more than 175 games with three teams in the minor leagues.